← Beyaz kurdeleler: The puppets address violence against women in Turkey and the U.S. When I last left you, I was musing on the White Ribbon Campaign which addresses violence against women – and was quite happy to see the dialogue that ensued (thank you, my e-friends). Our campaign was a success and the puppets’ artfully-crafted ribbons were a big hit with my students. After a long, 12-hour teaching day last Thursday, full of White Ribbon Campaign events, I wearily made myself a cup of çay in my office with my new hot pot to perk myself up for the long commute home. After slumping into the seat of my car, puppets splayed everywhere around me with a lot of snoring, I heard it, the unmistakeable sounds of a car problem. After calling M., I decided to try to get home, and made it. We resolved to check it out that weekend unless something more emergent happened. I got home with a funny engine sound, but no incident. On Friday, we consulted with the resident parental car expert, and decided something or other was loose…and kept on driving the great green lady who has served me so well for the past 12 years. Saturday morning I awoke early to a great cacophony emanating from the kitchen. I should have known it was the harbinger of challenges to come that day, but at that moment, I had forgotten all about the green car and all of her odd sounds. Instead, I was focused on great squeals of horror and cabinet doors slamming and drawers bashing in and out of their spaces, and it left me confused. What in the heck are those puppets up to now? Still asleep, as of course he can’t hear the puppets and their goings on, M. was sleeping heavily, his face mashed into the pillow in a manner sure to leave creases that might rectify themselves in a hot shower followed by a brisk frigid walk to work. Sneaking out of bed so as not to disturb M., I tip-toed into the kitchen to see what was what. My dog’s radar ears followed me before he deigned to leave the warmth of his spot at the foot of the bed in favor of loyalty. After cleaning up the mess, I set to brewing tea for the morning – hoping to achieve the just-right “rabbit’s blood” consistency that M. likes so. 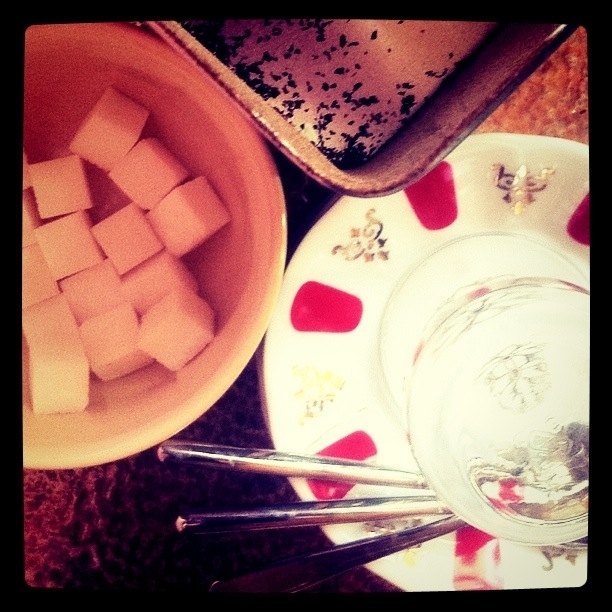 You may recall the post on moving from vegetarianism to rabbit’s blood tea, if not, click here. Of course, as soon as I opened the tea tin, all I was met with were a few strands of forlorn Assam and a few tiny nuggets of Rize çayi. No dice, no other loose tea in the house. I settled for a peppermint teabag instead. While we made it through the morning without caffeine, it wasn’t until mid-morning, when M. took the car to go to his art studio, that I realized we had a much bigger problem on our hands. As I picked up the phone to speak with M., all I heard was “it’s going to be $923.00.” To make a long story short, it’s time for a new car. Hanging up the phone, I decided I needed caffeine desperately, and walked down to the local, expensive market to get my fix – much to the chagrin of BOTH the Write-a-matrix and Haciyatmaz, who have been YELLING IN MY EAR for days now to get writing on something or the other. Many glasses of çay and car discussions later, we’ve settled on a plan to purchase a new car. We have done the preliminary negotiation – with M. breaking out the major Turkish hard-as-nails negotiation and intimidation tactics, much to the chagrin of a salesperson who finally yelled “uncle,” saying “I’d never play poker with you!” and “my boss will call me a yellow-bellied flatfish and a 220 pound weakling” (whatever that means). Now that we are back in business on the transportation front, it’s time to brew some çay and get back to writing. This entry was posted in A Karagöz puppet battle, Gendered moments, Turkish Food!, Visits from the Karagöz puppets and tagged Assam, driving, Rize, tea, White Ribbon Campaign, writing. Bookmark the permalink. As for machines going ‘Phutttt!’ at inconvenient moment – this is in their nature – or is it nurture? As a Prof you should know these things! You and me both, I am missing my mind more and more these days.